The NTSB is investigating the cause of a massive explosion and fire involving a natural gas line that destroyed several homes. NBC's Tom Costello reports. Updated at 6:45 p.m. 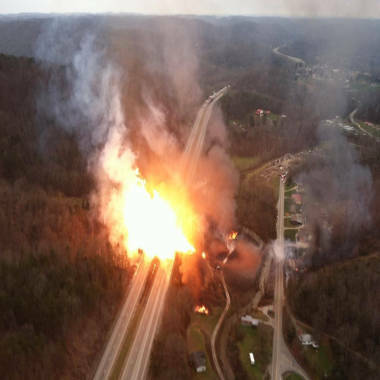 ET: A gas line explosion rocked the town of Sissonville, W.Va., Tuesday, setting off an inferno that burned multiple homes, damaged and closed a portion of the freeway, and knocked out power and phone lines to some residents — but remarkably, took no lives. The blast, which was reported at about 12:40 p.m. PT in Sissonville, a community of about 4,000 people located 10 miles north of Charleston. Flames shot some 100 feet in the air and hopped the main north-south arterial Interstate 77, as emergency responders scrambled to cap the ruptured gas line — a 20-inch transmission line owned by Columbia Gas — and bring the blaze under control. The blaze destroyed four homes and damaged at least five others, WSAZ-TV, the NBC station in Huntington, W. Va. reported, citing county officials. Gov. Earl Ray Tomblin told reporters at a press conference Tuesday afternoon that several people were transported from the scene for smoke inhalation-related injuries. But he said emergency crews had concluded there were no deaths and everyone had been accounted for. Earlier, an official said that the blast was near the Cedar Ridge Health Care Center, a senior-assisted nursing home. Metro 911 dispatchers said that the nursing home was not on fire, and its residents are not in danger. 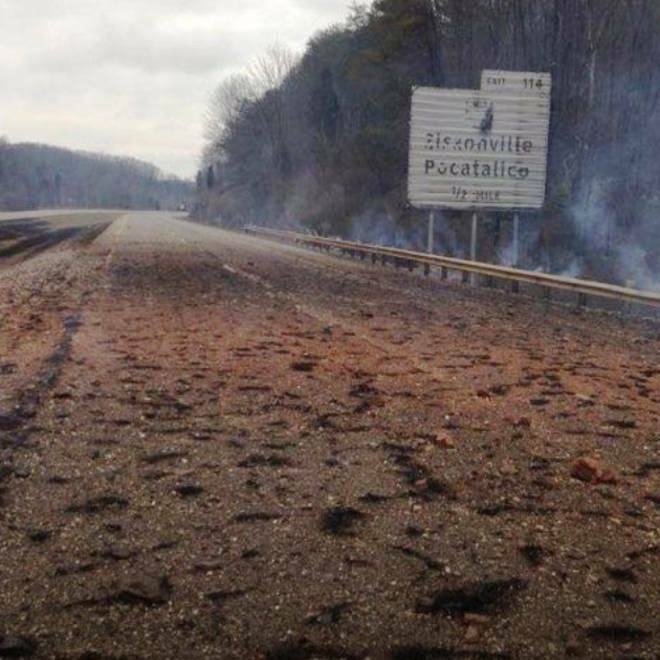 A section of I-77 near Sissonville, W. Va, on Tuesday after a gas explosion rocked the area. The flames shot more than 100 feet in the air, and jumped the highway caused the asphalt top to crumble. Tomblin said that the area within 1,000 feet of the explosion site has been evacuated. A fiber optic cable was also damaged in the blast, affecting phone service in several states, according to WSAZ. Local officials said that some 1,600 local residents had been directly affected, either by losing power or because they had to take a 50 mile detour around the closed highway. Columbia Gas confirmed that one of its transmission lines was the source of the explosion. "The site where the incident occurred has been secured and the fire has been contained," according to Chevalier Mayes, communications manager for the company. "There were residents near where the explosion occurred. Columbia Gas employees and first responders are working to assess the situation and accommodate the residents. Columbia Gas is still working to determine the cause of the explosion." Tuesday evening, the National Transportation Safety Board announced that it was sending a crew to investigate the blast and fires in Sissonville. The team was to travel to West Virginia Tuesday night and be on the scene Wednesday, the federal agency said. Meantime state transportation officials were dispatching crews to repair damage to an 800-foot stretch of I-77. A suspected gas line explosion rocked an area near Sissonville, W.Va., on Tuesday. "The road is not melted," said Brent Walker, a spokesman for the state Department of Transportation, correcting reports by multiple outlets, including NBC News. Speaking to NBC-station WBOY in Clarksburg, W.Va., Walker said the heat had caused the asphalt surface to crumble when the road was engulfed in flame. The highway was closed and traffic was being diverted. Walker said crews will be working to resurface the highway as soon as they can get through and may get traffic moving through as soon as this evening. Officials of a plant in the vicinity of the blast, NGK Spark Plugs, said that they had shut down for at least two work shifts, according to the report. Residents in the area, including children at Sissonville Elementary school had been told to remain inside, according to WSAZ. Later, school officials were arranging buses to take students across Sissonville to their homes. For residents who lost their homes or could not get home, Aldersgate Methodist Church in Sissonville opened as a shelter for the night, according to Metro 911, an emergency website provided by the county's emergency responders.